The much anticipated follow up to Rainbow Moon is here. The original was charming, if a touch simplistic. Its successor builds on its roots successfully and genuinely left me with a smile on my face. From minute one the story is filled with quirks and humour, from the main character Damion’s failing his Monster Taming Exam due to a hangover to some witty and genuinely amusing dialogue throughout the course of the adventure. The characters are introduced quite rapidly and before long we have our cast; Ashly, an amateur spellcaster and Layne another Monster Tamer in waiting, join Damion as they attempt to break the unbreakable spell binding them together. 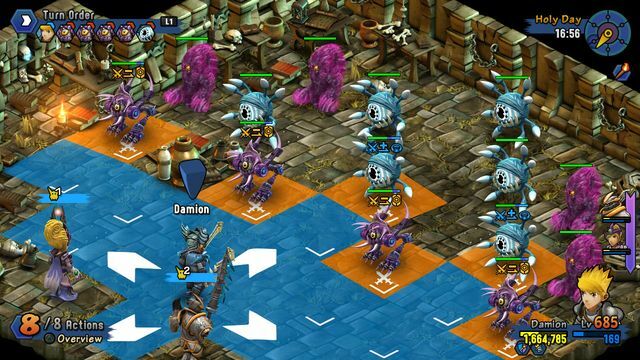 It’s a relatively simple premise but Rainbow Skies handles it excellently. Onto the gameplay. 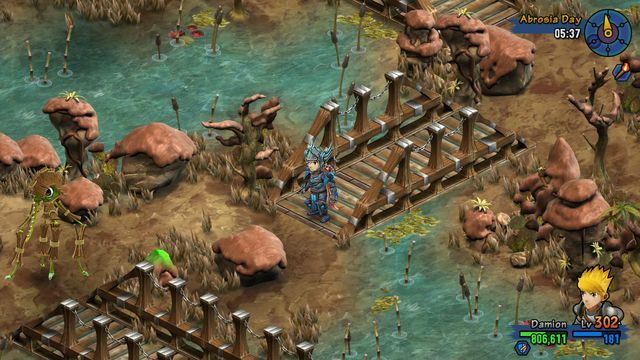 Rainbow Skies takes the form of a tactical turn based RPG, a genre I have been a fan of since my days pouring hours of hard work into Final Fantasy Tactics on the GBA. The game follows well established rules and yet somehow it feels fresh. This is in part down to the way that the battle mechanics work. Rainbow Skies cuts down the often tedious length of this vital component so that in general they last less than 5-10 minutes. This was a welcome change as I often found the length unnecessary; yes there is some tactical thought required to these games but come on, we’re not talking about some grand military battlefield, this is just 6 people fending off a few enemies. 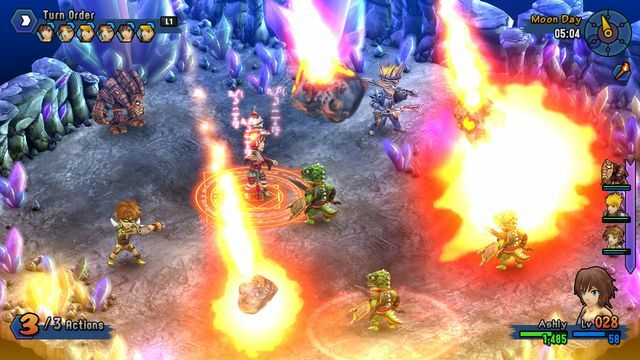 Rainbow Skies strikes this balance perfectly and really does enable the player to feel as though they are taking part in an epic struggle for the story rather than an epic struggle to stay awake. The enemies in the game vary their strategies consistently making each battle its own puzzle, sometimes you will be able to hack and slash your way through them, other times you need to take a more defensive approach. This was where all those hours wasted playing Praetorians actually came in handy, with some minor modifications and accounting for size the ideal defensive formations were closely aligned to those of the Roman and Greek armies. God bless the Phalanx! Of course, the battles are not just about dominating your opponent. As with any RPG the battles bring up your experience points which allow you to access more upgrades and items via the crafting system. This system is innovative and works well. 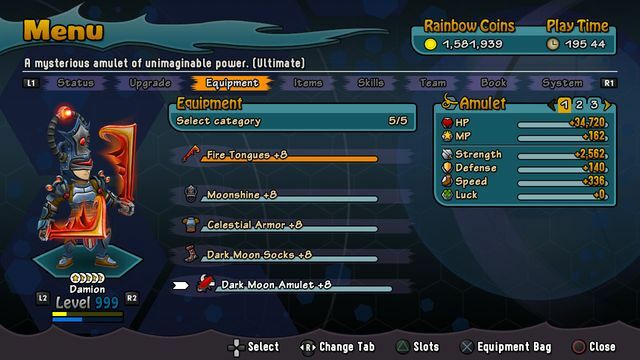 It is not just your characters that can be improved by experience, your equipment also gains experience through use and will become stronger over time. I thought this was a nice addition and really allowed full freedom when assembling my team; for the first time I wasn’t required to shed my weapons, armour etc. for the sake of becoming stronger, it grew with me. The sound is relatively standard, though the battle effects did change the atmosphere to a less serious one, but it was the graphics of the game that took me by surprise. The view is an angled top down view which instantly put me in mind of Pokemon X/Y, a game which Rainbow Skies shares a lot of similarities. In both you have this view with characters whose proportions are a touch off reality lending a more cartoonish air to the game. 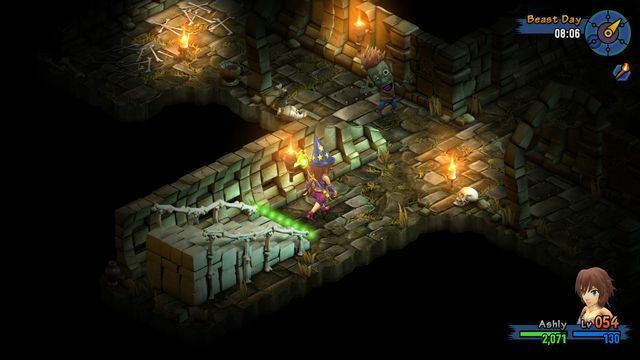 In both you will end up in maze like structures which are beautifully rendered here and in both you have the opportunity of catching the monsters that you encounter and bringing them into your team. I realise that most RPGs will share some similarities amongst the genre but at times I genuinely felt like I was playing a cross between Pokemon and Final Fantasy, I should have loved this but in fact after a while it began to feel a bit stale. Ultimately I enjoyed the way the game looks and plays but there was still just something missing, something that stopped me from feeling fully immersed in the experience. I think the reason for this was that I expected the game to be more ‘open world’ than it actually is. It plays as very linear and even the addition of side quests don’t really change that feeling. I don’t know whether this is the way that the RPG genre is moving as (not meaning to bring it up again) I personally felt that the Pokemon Sun/Moon series was a big step down from previous entries due to its lack of personal exploration, this led to the game feeling like more of a point and click story than a true RPG. 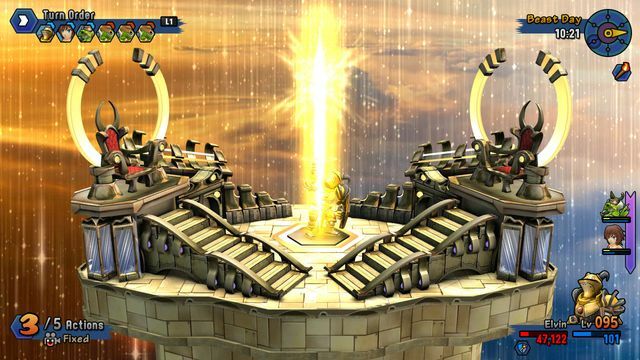 Rainbow Skies suffers with the same issue, it would have been good to have a more of an option to look around, to get lost and have to find your way back on track, as it is, this is nearly impossible. 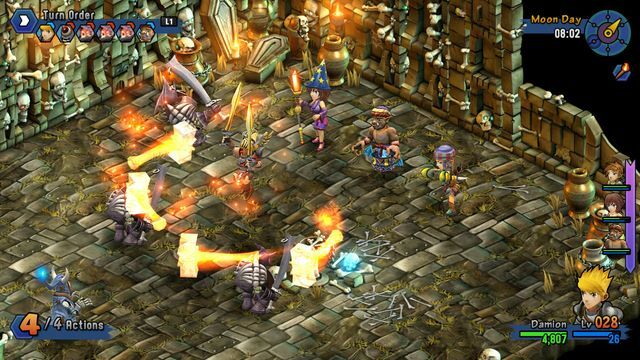 In Rainbow Skies the focus is truly on the battle system and creating the perfect team and it does that well, however there is one other issue that I have to address that can make the game really frustrating. The enemies. I have praised the innovative enemies in this game, their strategies change and adapt which really does make this a true SRPG but my main complaint with them is the inconsistency. In most games of this type the enemies get progressively more difficult as you make your way through the story i.e. at the same rate as you do. 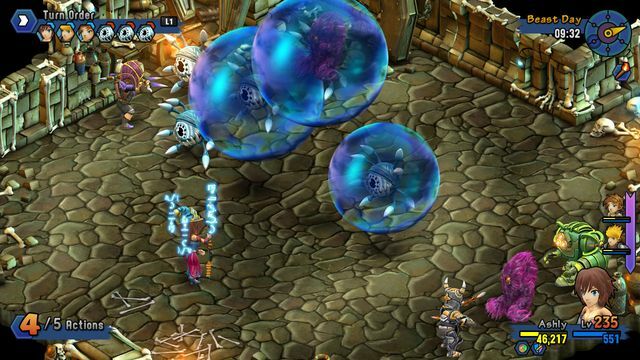 In Rainbow Skies though this is broadly true there are sudden and unexpected instances where the difficulty suddenly rockets and enemies will damage you far more than you are able to do to them. 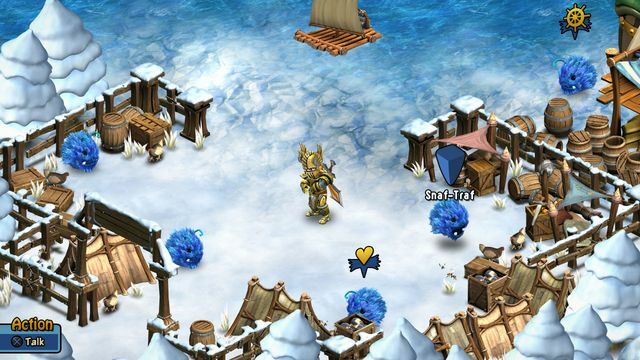 I guess that this is some degree of realism in that if you were wandering around a world where everybody and everything is spoiling for a fight there wouldn’t be a nice orderly progression, but this is a fantasy world and in breaking with the decades old tradition in this aspect Rainbow Skies begins to get really frustrating. Just when you think you’re making progress, BAM, and it’s a long journey back to that healer. 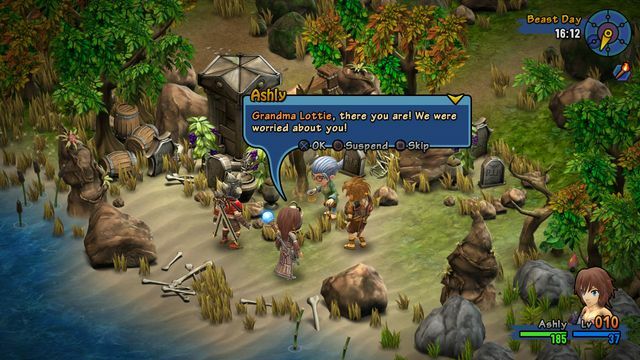 Overall, Rainbow Skies is a good addition to the SRPG genre. 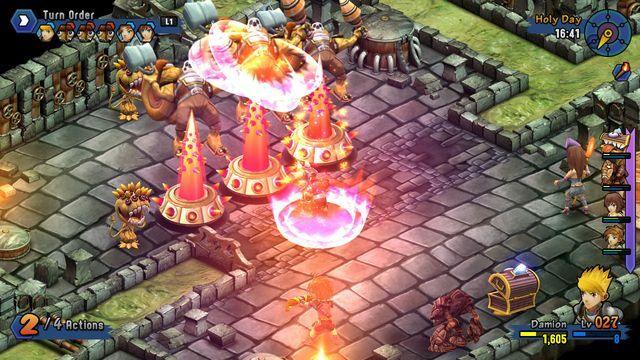 It blends an excellent battle and crafting system with humour and a superb graphical quality that only adds to its charm. There is a lot to like here and, though the sudden increases in difficulty can become an annoyance, I never got to the point where I didn’t want to play anymore. I suppose that’s the point, the game treads the line between fun and challenge very carefully and ultimately successfully. This one is an enjoyable escapade that any fan of tactical RPGs will enjoy, it’s just not quite as good as it perhaps could have been. 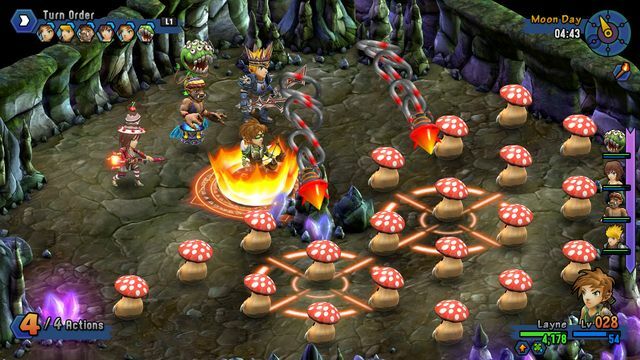 Rainbow Skies was reviewed using a digital code supplied by the publisher.